The weekly challenge at Stampotitque Designers Challenge, SDC 180, is make a Painted Background. The background was made by pressing a rubber stamp into a thick wet paint and allowed to dry. In real life it almost appears to have been embossed. The image was colored with markers and fussy cut. This is a skinny card, 3-1/4 x 6-1/2, which I thought was perfect for this image. The polka dots on her blouse were made with my new paint pen by Deco Color. Very nice, Gerrie. I like the background. You had fooled as I was sure it was embossed! Great effect on this fabulous card. Love the background, Gerri, and it really does appear to have been embossed! I have to say that I have both of those stamps, yet have never paired them. Brilliant! 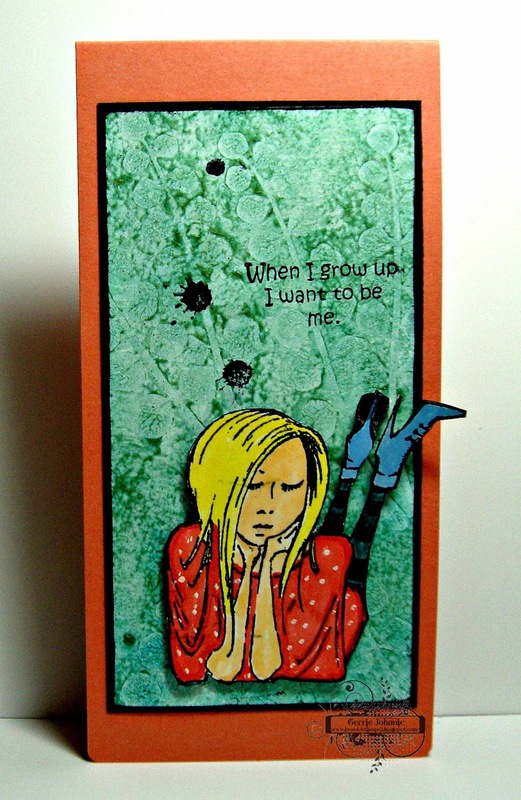 Great skinny card (if we could all be skinny like these cards :-)) Love how you did that painted background, very cool. Wonderful background on your fabulous card. Lovely painty background and great combo of stamps. Thanks for joining us this week over at Stampotique ! It's a beautiful card Gerrie. Thanks for joining us again at Stampotique this week.